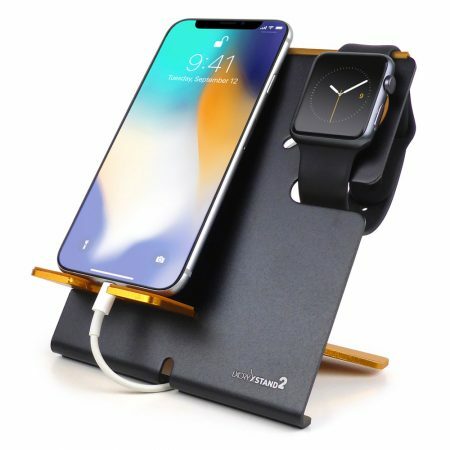 AN EVEN BETTER WAY TO CHARGE YOUR APPLE WATCH AND iPHONE – This new and enhanced version of the XStand comes with a re-designed, much more sturdy padded footing. 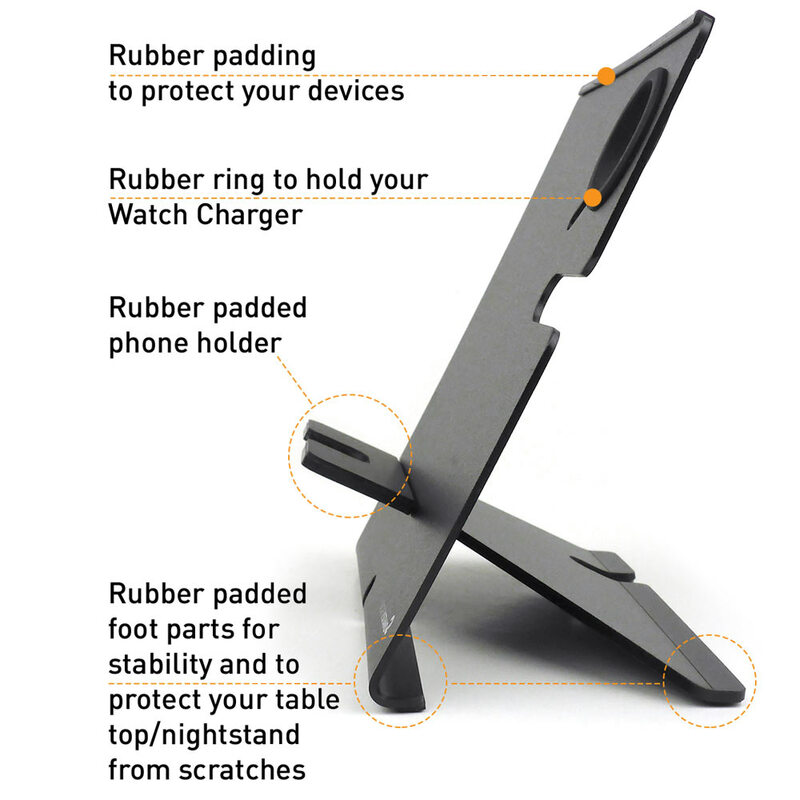 Sits rock-solid on your table top or nightstand. 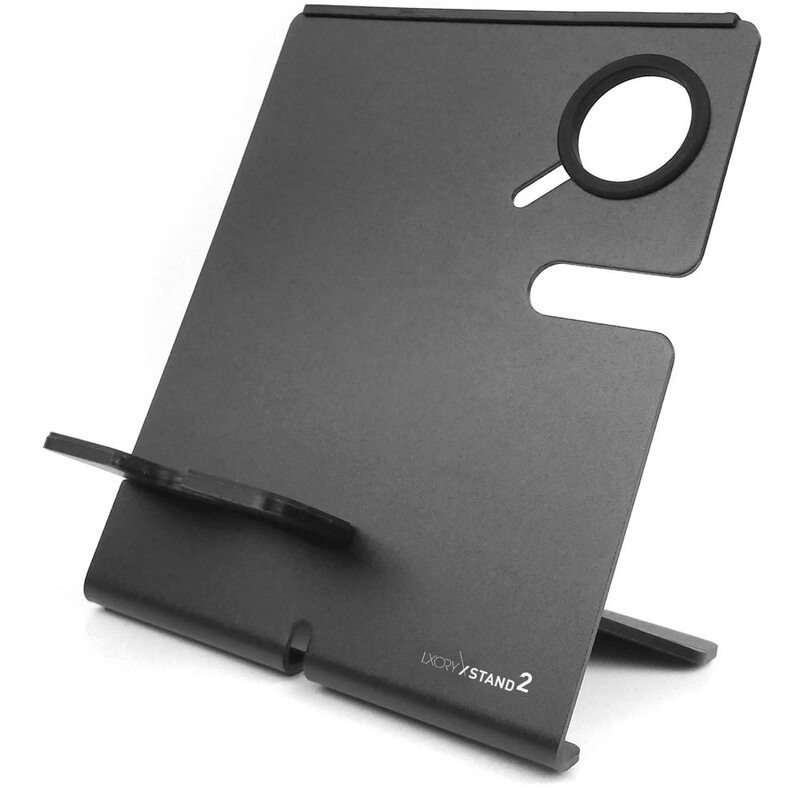 The flat phone holder provides more space for thicker cases and makes it easier to put-on and take-off your phone. A perfect bedside compliment to your bedroom that keeps your nightstand tidy and flaunts your watch and phone at a perfect viewing angle. “WOW – WHAT’S THAT?” Is the reaction our customers get from co-workers. Try and see for yourself. The XStand is attractive enough to be a conversation starter. Made of high-quality metal with a satin finish it looks like a luxury item and far more expensive than it is. A cool looking, upright place to put your phone. Sturdy. Metal. Classy. A COMPACT TABLE ORGANIZER BY DESIGN. Such a breeze to keep yourself updated of all the notifications you are getting. No more picking up your phone after every “ding”. So much easier to keep an eye on your phone and watch while working on projects. Watch videos, use FaceTime. All hands-free. Works with almost any phone and case. Even small tablets like iPad mini and Kindle Fire. TRAVELS EASY: The dock is foldable and can easily slip into your carry-on bag. Just take it apart, wrap the cables around the 2 metal pieces & stick it in a zip lock bag. Set it back up in your work place or hotel, plug the wires in & instant charging station. PERFECT GIFT – The beautiful packaging is on the luxury side. Attractive and fashionable. 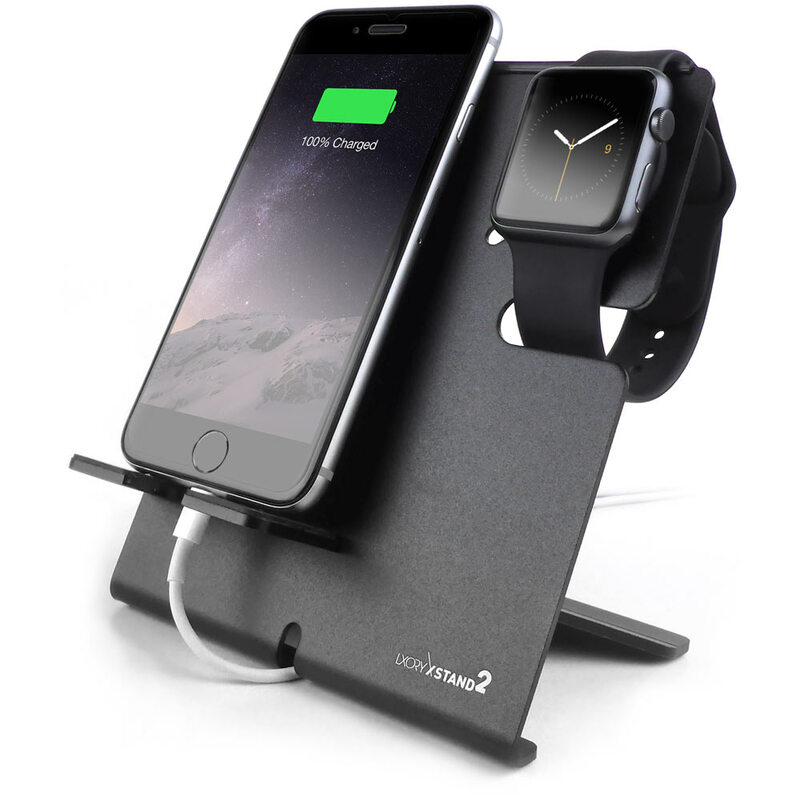 You can consider this Apple Watch charging station as a gift to any friend. Looking for an Elegant Apple Watch and iPhone Dock? If you own an Apple Watch and an iPhone, you may want to organize your devices, chargers and cables in one place. The LXORY XStand is designed to do just that. Its elegant design reflects the simplicity and ease of use Apple products have flaunted over the years. The circular rubber padded cut-out holds the Apple Watch charger perfectly in place while providing an outlet for the charger cable. 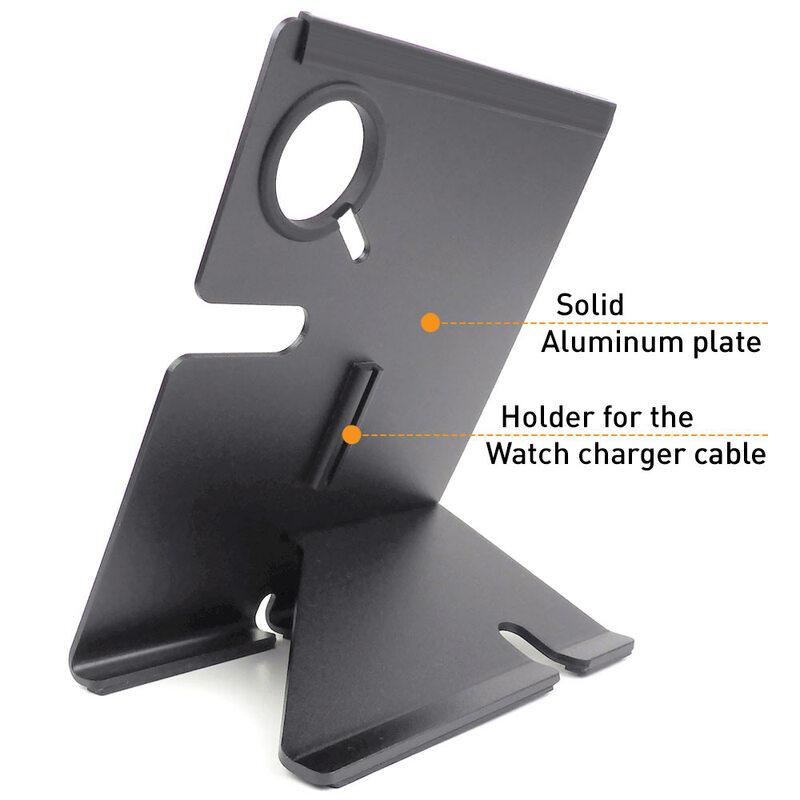 The silicone padded phone holder makes it easy to place your phone in an upright position. A cut-out also leaves space for the charging cable. 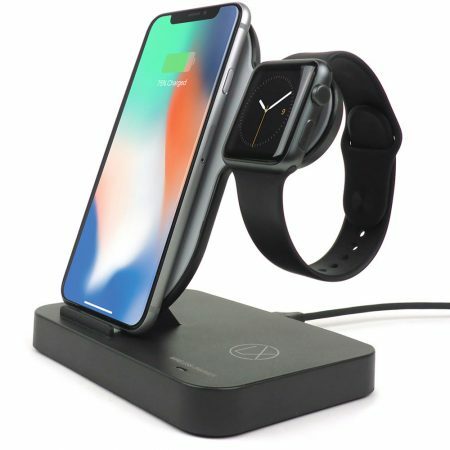 The proportions of the Apple Watch and iPhone charging stand are carefully chosen to provide maximum stability without taking up much space on your table. If you plan to enjoy the benefits of cable-free phone charging, this is the right stand for you. 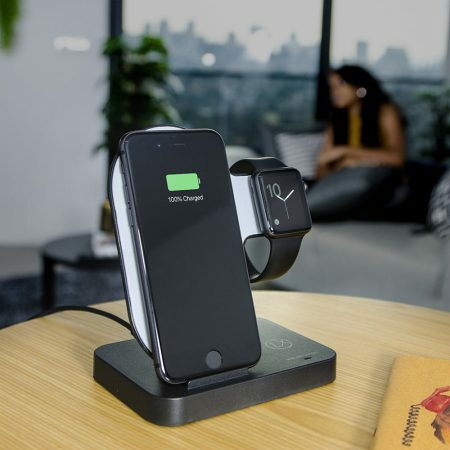 Our Wireless Charging Set for iPhone was created to upgrade the XStand to a wireless charging stand. So that you can enjoy the same ease charging your iPhone as you already do with your Apple Watch: just place it on the charger and done! To find the wireless charging upgrade, just copy-paste B01MXRWVA9 into the Amazon search bar or click on “LXORY” on top of the title. 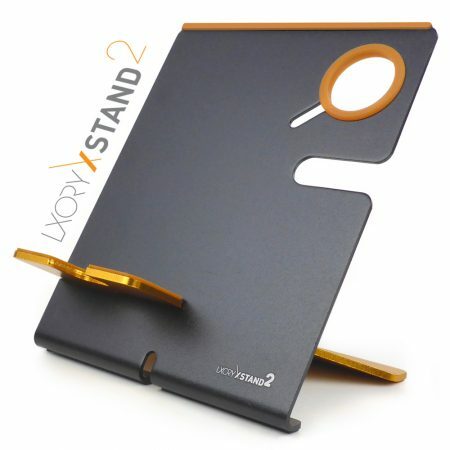 Get your XStand now − risk free Our products come with a lifetime happiness guarantee. If you’re not happy with our product, you get your money back. With the added convenience of wireless charging for your mobile device. 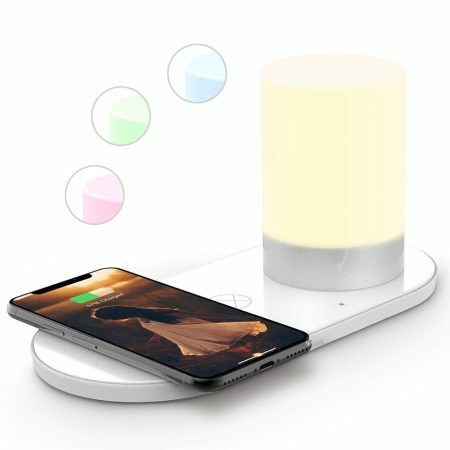 This is both a table lamp with multiple light settings and a wireless charger for home or office. The perfect gift for friends or family. Simply tap the touch-sensor and switch between low light, bright light and a soothing colour-cycle-mode that will add a calming, meditative element to your room. Enjoy the convenience of qi wireless charging – no more messy charging cables on your bedside table. 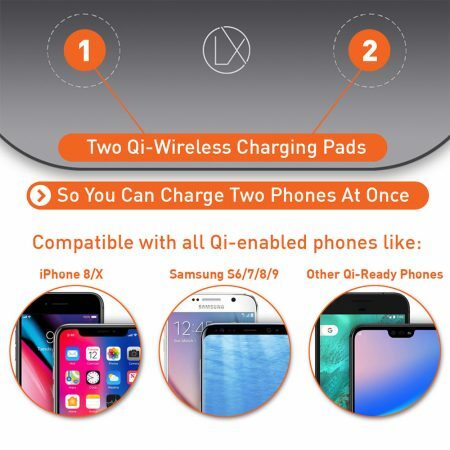 The 9W charging pad is compatible with all qi-enabled devices like iPhone 8/X and many others. Perfect to charge your phone over night. The built-in USB output can charge an additional device. It does not take up a lot of room, so it is convenient to keep on the bedside table. 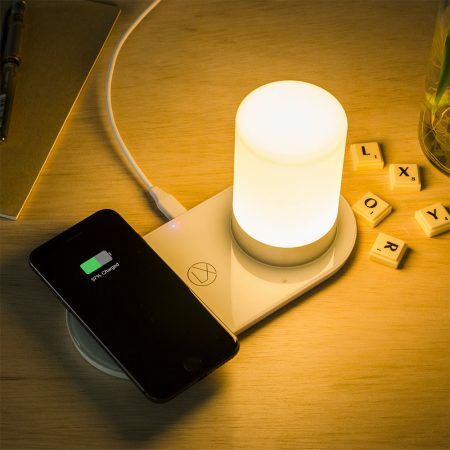 The nightstand lamp is definitely beautiful (the soft light also makes room pretty) and the charging is really fast. The wireless charger lamp comes with a cable and a Qualcomm 3.0 wall charger, so all you have to do is plug it into a wall outlet. Easy and trouble-free setup. Charge your iPhone and Apple Watch at the same time. Unlike other Apple Watch stands, the magnetic charging module for your Apple Watch is built-in with this dock. So you don’t have to insert your existing watch charging cable. Save a lot of tears and money on broken cables and ruined charging ports. You won’t miss having to track down and plug in wires. No more cord clutter on your counter top, coffee table or night stand. Keep both devices at a comfortable viewing angle so you can check your notifications without having to pick up your phone. 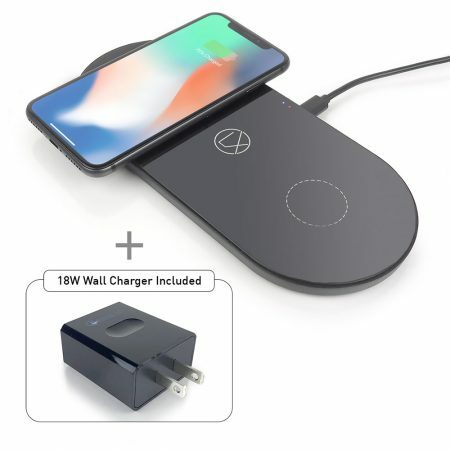 The Apple Watch and iPhone wireless charging stand comes with a USB cable and a 18W wall adapter. Just connect it to an outlet and you’re done. No assembly required. Simply place your devices on the stand and enjoy wireless charging on both devices. JUST LIKE HAVING A DOUBLE GARAGE MAKES SENSE IF YOU HAVE TWO CARS, Our Dual Wireless Charger Pad is the smarter choice if you have or plan to have a second wireless charging ready phone. So you won’t have to buy a second charger. 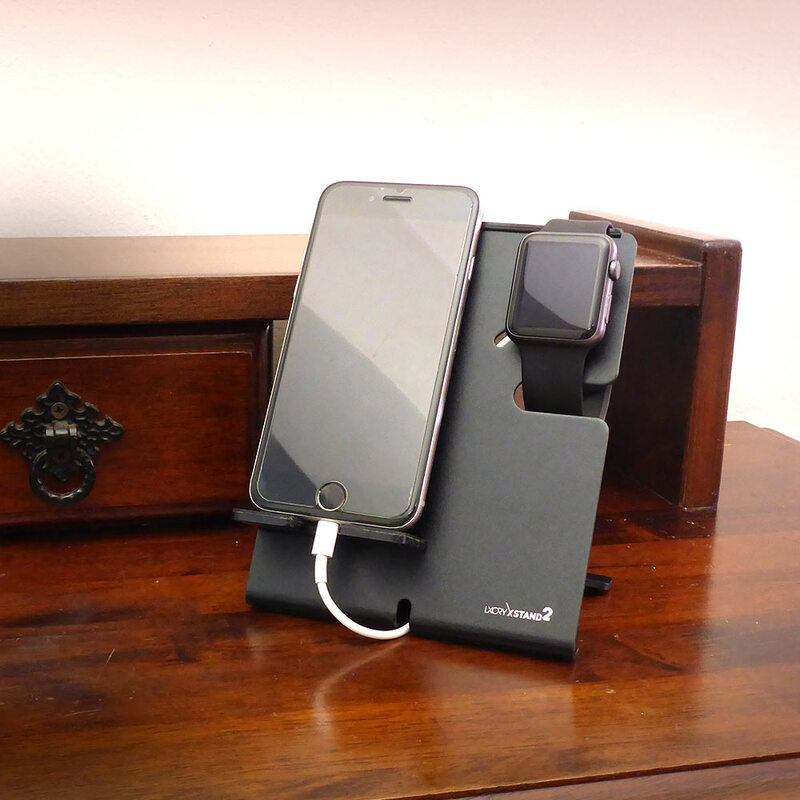 Save money and desktop space by buying a two phone charging station right away. CHARGE UP TO THREE DEVICES AT ONCE! 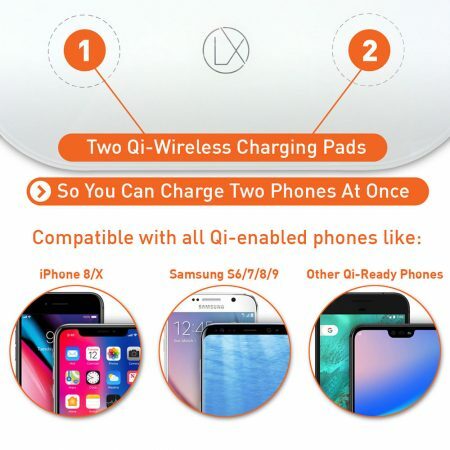 The LXORY Qi Dual Wireless Charger comes with two 9W Qi charging pads and one USB power outlet so you can charge a third device using a USB cable of your preference. 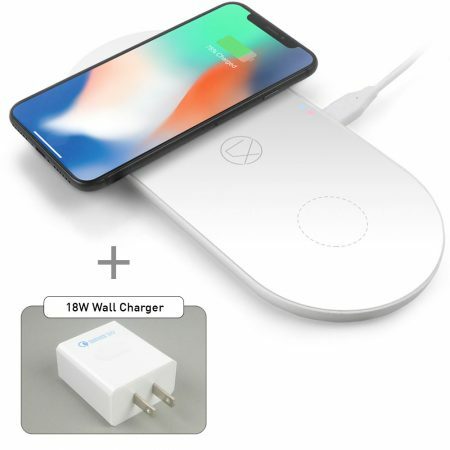 A Qualcomm 18W QuickCharge Adapter (US plug) is included. BUILT-IN THERMO PROTECTION. A Wireless iPhone charger gets warm while charging. Cheap chargers can overheat your phone. We included a temperature sensor in the two phone wireless charger which will limit the maximum temperature of the transmitters to a safe range. So that your phone is protected from heat damage. SIMPLE TO SET UP AND EASY TO USE. Plug the adapter (included) into the wall, connect the charging pad using the USB cable (included), place your Qi-enabled phone on one of the transmitter pads – done. Your phone is now charging with ‘no strings attached’. SLIM AND STYLISH LXORY-DESIGN. Only 9mm thick and 8” wide, this charger takes up a minimal amount of space and looks great on any counter or table top. Comes with anti-slip rubber feet, a Wall Charger and a USB cable. 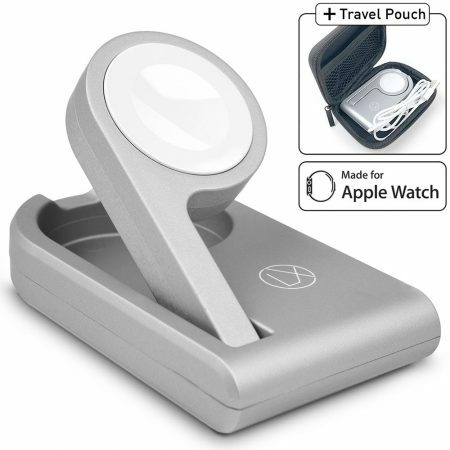 APPLE CERTIFIED APPLE WATCH CHARGER Fully functional magnetic iwatch charger (not just a holder or case for your existing charging cable!) to compliment or replace the magnetic charging cable that came with your apple watch. This product was tested by Apple an certified to be compliant with Apple standards (MFi certified) so you don’t have to worry if it works with your Apple Watch. It does. COMPATIBLE WITH ALL MODELS Works with Apple Watch Series 2, Series 1, 42mm, 38mm with opening wrist band (Sport, Woven Nylon, Leather, Milanese Loop and others). Not suitable for closed wristbands (Link Bracelet). ACTIVATES NIGHTSTAND MODE. The unique foldable design lets you choose your favorite charging position. Flat on the table or lifted up to activate nightstand mode and a more comfortable viewing angle. 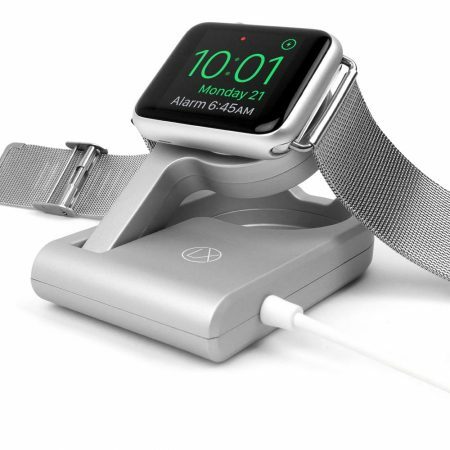 PORTABLE TRAVEL FRIENDLY APPLE WATCH CHARGING CABLE TO GO. We included a customised, padded zipper pouch so you can store the charger neatly and take it along for work or travel. Charge your watch at home or where ever you go – in your car, office or hotel. © 2019 LXORY Registered Trademark. All rights reserved.